We have tested our fair share of buggies over the four years I have been a parent, from simple strollers, to bulky doubles and the odd sports buggy too. The Quinny Longboarder is like no other though and I couldn't resist borrowing one to have a go. It comes already built so it was ready to go as soon as it arrived and I couldn't wait for the bloke to get home so that I could take Archie for a spin in it. It is suitable for children over 1 and under 15kg so Archie was perfect for my passenger. The Quinny Longboarder isn't designed for going around the town, you need a nice flat surface to really get the most from it, and we are lucky enough to have a beautiful wide promenade just around the corner from our house. A large park would work just as well - wide paths are easiest when you start off (if you are as bad at steering buggies as me!). I started off slowly, but after 5 minutes (of Archie shouting 'let's blaze' and 'go faster Mummy') I soon picked up speed and it was exhilerating. Everyone stops and stares, teenagers that wouldn't have noticed me before suddenly think I am pretty cool (A pair of 15 year old boys stopped to tell me this) and your legs really burn at the end. I was not expecting it to be nearly as much of a workout as it was! I did find the handlebar a little low, but then I am 5 foot 9. It wasn't uncomfortable but an extra couple of inches would have been nice. 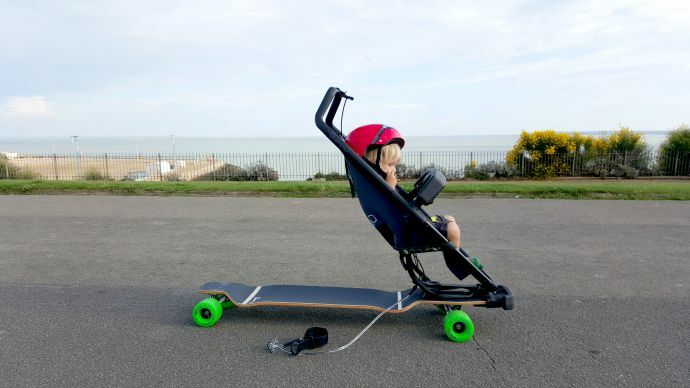 The buggy folds really flat, with the seat collapsing on to the longboard. This means it takes up very little space in the house, but because of the length, it didn't fit in our car so we couldn't take it anywhere that wasn't walking distance from our house. 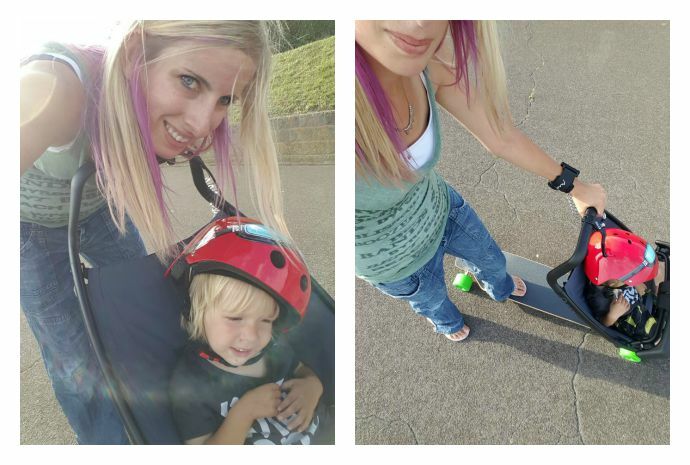 The Quinny Longboarder is amazing fun, I was very reluctant to give it back and it is a great way to sneak in some exercise. If you like giggling toddlers, something a bit different,being outdoors and getting a lot of attention then this is the buggy for you. This is fantastic and you look desperately cool on your skateboard! Also - PINK HAIR? !